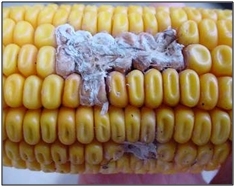 Corn grain can be naturally contaminated by mycotoxins, natural toxins produced by fungi. Though most Kentucky corn crops are free of mycotoxins, fumonisins are the most common threat. These toxins affect a number of animal species, but horses and pigs are among the most sensitive. Aflatoxins are generally very uncommon in Kentucky, but when they occur, they can cause serious disruption to grain marketing. Both mycotoxin families pose health risks to humans. Figure 1. 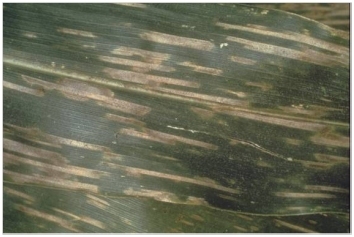 Fusarium ear rot of corn, usually associated with fumonisin contamination. Soybean Rust Risk for KY Still Very Low. SBR is really taking hold in southern and northeast Alabama, and also in parts of Georgia, Florida and South Carolinia. However, there is limited activity in the Arkansas, Louisiana and Mississippi at this time. For example, a report I received today from Mississippi State University’s Dr. Tom Allen indicated that SBR is “hard to find” in that state. He attributed that outcome to rather dry conditions across much of that state during the last month. I see no immenent SBR risk for KY at this time. Thus, our risk continues to be very low. Most of Kentucky’s full season soybean crop is now out of the woods now in terms of risk – they are just too far along and SBR could not develop fast enough to hurt them - but doublecrop beans still could be significantly affected if we were to find rust in the next couple of weeks (which is very unlikely in my opinion). We are continuing to monitor five sentinel plots for SBR. I will let you know if there are any changes to the status quo. 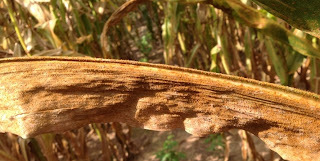 After my post yesterday about stalk strength, a seed company representative sent me images of substantial lower-canopy damage of southern rust in certain fields in western Kentucky (see figure). I hadn't seen this level of damage in my own field visits this season, but this level of damage is certainly capable of affecting stalk health. As explained yesterday, if leaf blighting occurs during grain fill, the corn plant often "cannabilizes" the stalk to fill the grain. This can result in weaker stalks. The current forecast suggests that warm nights with dew will continue for a least a few days, so southern rust will likely continue to develop in some fields. Again, this is another reason to watch fields for weakening stalks, and to consider this in scheduling fields for harvest. Excellent yields are expected in many corn fields this growing season. Along with that good news comes concerns over stalk strength. Plants in many fields have heavy ears, along with shallow roots because of abundant rainfall. Many of these plants could topple easily as they mature, especially if a late-season storm with high winds blows across the field. Plus, several extended periods of cloudy weather during grain fill may have increased the risk of stalk weakness in some fields. This is because, when the corn plant is filling grain, if leaves cannot meet the carbohydrate demand of the grain, the plant may “cannibalize” carbohydrates in stalks in order to fill the grain. Similarly, infectious diseases may play a role in increasing stalk weakness, by depriving the plant of healthy foliage necessary to maintain stalk strength through crop maturity. Gray leaf spot (Figures 1-2) is prevalent this year, although levels generally appear to be low to moderate. Figure 1. Lesions of gray leaf spot, viewed by holding up to the sky. 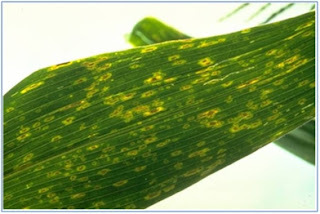 Some hybrids develop an obvious yellow border around these infections, as shown here. Figure 2. 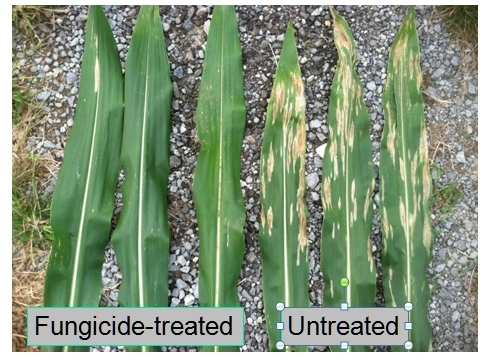 Lesions of gray leaf spot in a highly susceptible variety. They are often described as "match-stick" lesions. 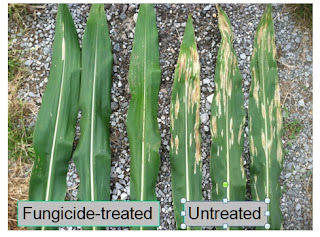 I have also observed scattered fields with significant damage from northern leaf blight (Figure 3). Given the generally mild, wet weather this season, this isn’t surprising. 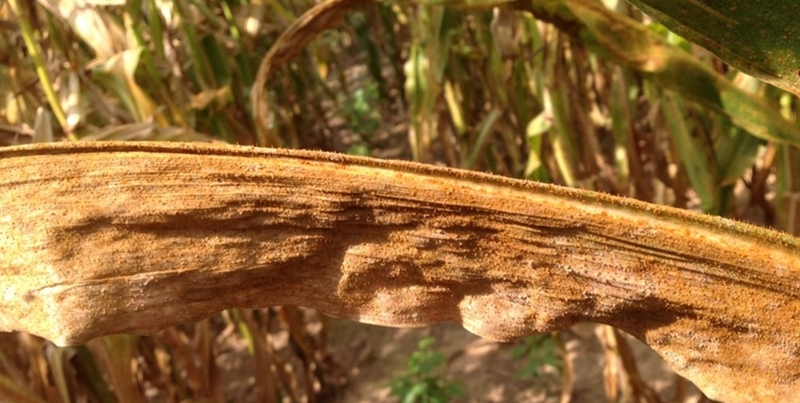 Although southern rust has been present in Kentucky for over a month, some cool weather experienced in recent weeks has helped suppress disease activity. This disease may still contribute to weakened stalks in some late-planted fields, but in general, it appears we have “escaped” widespread damage from this disease this year, especially if cool nights predominate. Check for stalk weakness by walking the field and pushing plants about 1 ½ feet from vertical. Those that fail to spring back exhibit lodging potential. If 10-15% or more of the field show lodging potential, it may be wise to schedule that field for early harvest, before it is laid down by strong winds. Armyworms are sneaky so watch your fields!